I Doubt It is a fun, fast-moving card game that's great for children and adults to play together. The game requires players to simply know the cards, in descending order, and have the ability to bluff. 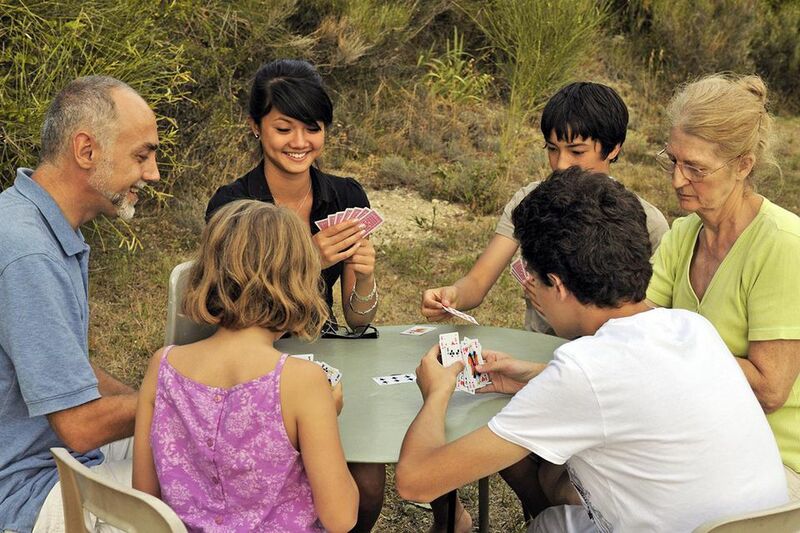 It can be fun to play with both friends and family and see who can bluff their way to winning the game. I Doubt It can be played with one or two standard 52-card decks. With two decks, it's best (but not absolutely required) to have identical backs so that the players cannot tell them apart. Be the first player to get rid of all your cards and you win the game. The first player plays one or more cards from his hand, face down, starting a discard pile in the middle of the table. He says, "One Ace," or whatever number is appropriate (i.e. the number of cards he played), always starting with Ace. The second player plays one or more cards from her hand, face down, on top of the discard pile. She says, "Two Kings," or whatever number is appropriate (i.e. the number of cards she played). This continues with each subsequent player moving down one rank, so the third player would say "Queens," the fourth "Jacks," the fifth "10s," and so on. After a player discards (or claims to discard) 2s, the next player will discard (or claim to discard) Aces. It is perfectly legal, and in fact necessary, for players to sometimes play cards that are not what they say. For example, a player might play a 10 and a 9 but say, "two Queens." The only penalty comes if such a player is caught (see "Doubting," below). If a player names the wrong rank (i.e. says "Two 5s" when he should have said "Two 8s"), that player must take all of the cards from the discard pile and add them to his hand. After each discard, any other player can say, "I doubt it." The last player's discarded cards are then turned face up. If any card in that set is not of the stated rank, the player who discarded them must take the entire discard pile into his hand. If all of the cards in that set are of the stated rank, the doubter must take the entire discard pile into his hand. NOTE: The first player to say "I doubt it" is the official doubter. If more than one player says "I doubt it" at the same time, the player closest to the left of the one who made the discard is the official doubter. The first player to get rid of all her cards wins. The last play is always made face up because other players will inevitably doubt it.